Thomas Golf offers a wide variety of putter heads available in the traditional putting style set up. The traditional putting style, is most commonly used by a majority of golfers. The traditional style works best for golfers who don't have any trouble keeping their wrists together during the putting stroke. The biggest advantage of the traditional putting style is that you are able to take the standard putting address, where you bend your body at the hips, which in turn places your eyes directly over the golf ball. The Thomas Golf AT 40 Putter has been referred to as "The Dream Putter" with its high level of custom-ability, one-piece construction, jewelry appearance, CNC cutting, Champagne finish, and impeccable performance. We use Computer Numerical Control (CNC) to achieve the details of form, balance and insure a perfectly flat putter face. The face of the AT 40 is finished in chrome after it receives 100 independent to get that unmistakable look and feel. The AT 40 truly is the pinnacle in putter design and technology. 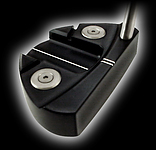 The AT 60s is a more compact mallet putter that still provides a solid feel. 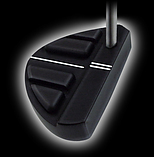 The unique linear bi-level design on the AT 60s allows for easier ball framing, resulting in more accurate and consistent putts. The AT 60s is separated by two different elevations, which help you place your eyes directly over the golf ball. If you alignment is off, you'll be able to tell by the black and gold alignment indicators. The AT 80 mallet putter, with a wide alignment plateau, frames the ball and passes across the putter from the face blade to the back. This plateau works in synergy with the specially designed aiming indicator. The AT-80 has a special red polymer striking surface for optimum feel and superior control. 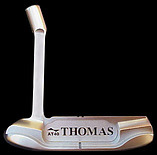 Thomas golf also offers putter models with our popular hybrid head shape. The AT 705 is the pear shaped hybrid putter that features the head qualities of a hybrid with the loft and feel of a standard putter. As with all Thomas Golf hybrid clubs, the AT 705 features a snag-less body and sole design that eliminates mishit puts caused by grounding the putter. The Thomas Golf hybrid putter is also great for hitting from the fringe or fairway for extra accuracy when you don't want to hit a wedge. For golfers looking for a non-traditional putter style, Thomas Golf also offers many putters available in a mid or belly length style and the long putter style. A lot of left-handed golfers have difficulty finding equipment to suit their game. Thomas Golf offers a wide array of putters for the left-handed golfer. For golfers who like the traditional putting style, we offer the AT 30, AT 70, AT 71, AT 72, AT 80 and AT 91. With Thomas Golf, there is no reason that you should sacrifice your equipment, because you swing left-handed. All Thomas Golf equipment, even our left-handed putters, are fully customizable to your body and swing type.